When you get started, we’ll invest $500 in helping you to market to your service area. As soon as you’ve claimed your territory, Vagabond will build your regional vīv Supplies tile. 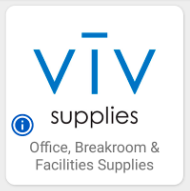 Your company will have its own instance of our default vīv Supplies tile show up in vīv for users in your area. The tile will contain available products at nationally viable pricing (you can change pricing, sales tax, cart minimums, service fees and control where your tile is visible). Our Marketing team will start advertising in your area through Facebook and Google. This helps get the word out and drives consumers to your vīv Supplies tile. Of course, most of the traffic will come from you promoting the service to your accounts and to other businesses in your area. All ads send potential consumers to vgbnd.co/supplieslanding and you can use that link too as an account-oriented brochure about vīv Supplies. We will reward your first 12 accounts with a $25 VISA gift card just for placing their first order through your vīv Supplies tile! We’ll also use your logo to send you 100 leave-behind cards that can be used as you start talking to your accounts and all the businesses in-between. Cards take 7-10 business days so we’ll send you a generic electronic version to start. You can see a sample of the leave behind card at vgbnd.co/supplies. We also send seasonal product promotional emails from time to time. We will send you promotional flyers that you can print for your customers too. 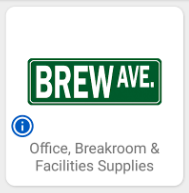 Once you’ve claimed your territory, we’ll send press releases to various community and business journals in your area letting them know you’ve entered the market with this new service.